Catbug has fun playing with his toys again! REBECCAAAA! I love Catbug, and he's so cute in this drawing. Awesome job! Oh my gosh that was my favorite Bravest Warriors short. My friends and I reenact it all the time. Great work! This is adorbs! Rebecca X Sir Jeffers all the way! hahaha YES. thank you for doing this. "Rebecca you are the prettiest girl in all of Brooklyn." "I..I am in love with another." "No. I am in love with your brother." Hes so cute. 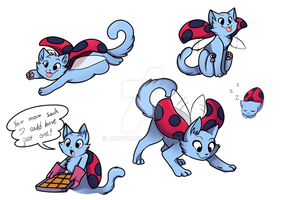 Loveeee Catbug!!! I... I don't love you... WHOOPSIES! As confused as I am, this is hilarious. MY FAVORITE CATBUG BY FAR!!! Good job on this piece. Ahhhhh the joys of an imagination giving life to sticks & potatoes. ............also WUUUBEEEECCA!!!!!!!!!!! "I... I don't love you. Whoopsies!"